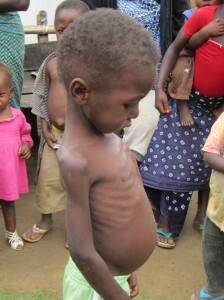 Kpaytuo Village broke our hearts to see all these malnourished children. 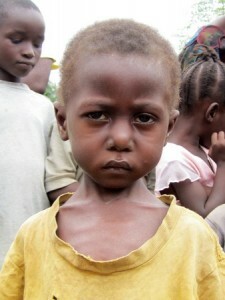 The HOPELESSNESS in the eyes of a child is so incredibly sad. 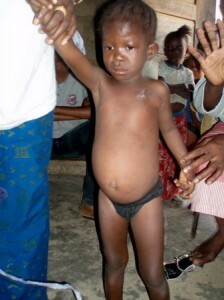 This little boy has kwashiorkor which is malnutrition caused by protein deficiency. 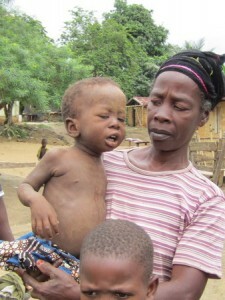 The good news is that he is on Hope for the Nation’s Feeding program at Mama Leweah’s house, where he will get all the nutrition he will need to become healthy. 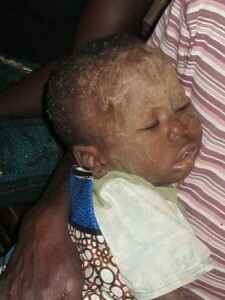 Provision of Hope has partnered with Hope for the Nations to help fund the nutritious supplements these children need. Hope for the Nations first asked us to visit this village in 2008. Since then we’re feeding as many as we possibly can. THANK GOD FOR THIS FEEDING CENTER. THESE CHILDREN WILL LIVE AND NOT DIE!! 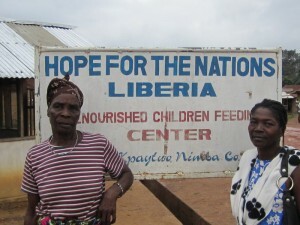 Ma Mary ( left) is standing with Maryann who teaches Health Awareness to the mothers. 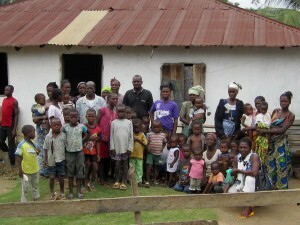 A group photo of Leweah’s family and some of the children who are on the feeding program. 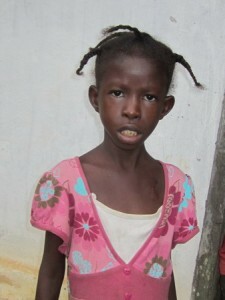 Jackerline Meatee in 2008 was very sick needing so much treatment. After getting the proper nutrition and care she is healthy, strong and energetic. The second photo was taken in August 2012. 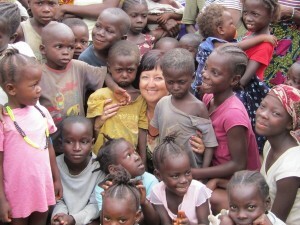 One by one we can make a difference in the lives of these precious children. Millions of children under the age of 5, still die every year due to preventable diseases. It does not have to be that way. Not in today’s world. I left there knowing, there is still more that we can do. More distressed children coming for treatment and supplements. 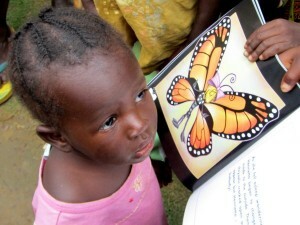 Every child loved THE STORY OF HENRIETTA CATERPILLAR as told by author Kristine Riley. Amazing to see the difference your outreaches have made for these “precious treasures”. Keep up the great work for being there! 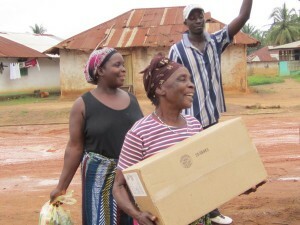 You are truly a blessing to so many of our African neighbours. Stay blessed, my dear friend! I have to quote Mother Teresa’s words….”We ourselves feel that what we are doing is just a drop in the ocean. But the ocean would be less because of that missing drop. It REALLY does feel that way at times. One by one we keep reaching more. 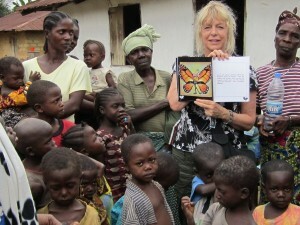 You are ALL A PART OF THIS WONDERFUL WORK!! !